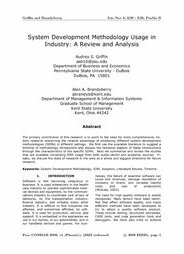 The primary contribution of this research is to point to the need for more comprehensive, holistic research concerning the relative advantage of employing different system development methodologies (SDMs) in different settings. We first use the available literature to suggest a timeline of methodology introduction and discuss the temporal aspects of these introductions through the characteristics of the specific SDMs. Next we summarize and review the studies that are available concerning SDM usage from both public-sector and academic sources. Finally, we discuss the state of research in the area as a whole and suggest directions for future research.